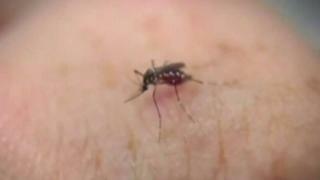 Two dead birds found in Walnut Creek and a group of mosquitoes from Discovery Bay are the first cases of West Nile virus detected in Contra Costa County this year. The Contra Costa Mosquito and Vector Control District announced the findings Monday and also announced that crews will be fogging in Discovery Bay on Tuesday between 9:30 p.m. and midnight. The area to be treated is bordered by Lakeview Circle and Castle Rock Loop to the north, Wilde Drive and Wilde Court to the south, Bixler Road to the west and open fields to the east. "Dead bird reports help us pinpoint virus activity in the county," district scientific programs manager Steve Schutz said in a statement. "Right now, we have very few reports. We really need the public to report dead birds to the state hotline so we can understand where else in the county the mosquitoes may be transmitting the virus and where we can focus our control efforts." The district looks for mosquitoes in catch basins, neglected swimming pools and other water sources that may serve as breeding havens for the insects. It also encourages residents to reduce their risk of contracting the disease by dumping standing water, using mosquito repellent, avoiding being outside when mosquitoes are out -- typically dawn and dusk -- and taking care of their swimming pools. The district urges the public to report dead birds to the California Department of Public Health by calling (877) 968-2473 or by visiting the state agency's website at www.cdph.ca.gov.